I guess, in the end, life just gets in the way. Our first post on Boston Twins was on June 20, 2008. 226 blog posts, 195 published comments, 1,000+ photos, 71 videos, and 20,000 pageviews (to date) later, we're officially closing up shop. So much has changed in the four years since we first posted here, not the least of which being the birth of Colin and Ava back on November 26, 2008. Since then, we've moved out of Boston, changed jobs (twice), and left a job to stay home with the kids. The adoption of facebook as sharing tool has moved alot of our photo posting over there and the fact is it is tougher to find time to edit photos and video, write posts, and publish on a blog with 3-year-olds than it is with 3-month-olds! We notice some of the other family bloggers that we've followed who have kids the same age as ours seem to be in the same boat - blogging dropped to very low on the priority list. 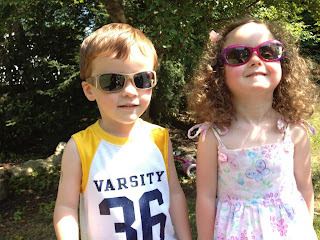 Sharing photos, however, did not - so please friend us on facebook to see tons of photos of the kids as they grow. Friends and family know where to find us. We do keep reading and trying to respond to any of the comments and questions we get about some of our most-visited posts, which seem to all be related to various medial issues we posted on - all of which are distant memories for us at this point. Colin's Strawberry Birthmark is our most popular post of all time, and Strawberry hemangioma and strawberry birthmark are two of the top-10 keywords from which folks found our blog. Colin's strawberry birthmark is a thing of the past at this point, it has flattened and faded to the point that - underneath his hair - we can barely even find it anymore. Compare that to those early pictures! Two different posts related to Colin's plagiocephaly helmet were 2nd (Cranial Remolding Helmet) and 3rd (Plagiocephaly Helmet Progress) most visited. Colin's big, round head (it's like sputnik!) has been good ever since the three months he had to wear that helmet. I remember him missing it and being unable to sleep when he was done with it! That three months flew by and it was totally worth it (if you can get your insurance to pay for it) - still the only medial treatment with 100% success and 0% side effects (as far as we know). Roseola post was 4th most visited and the highest incoming keyword term to the site. Turns out she never even had it, just an allergic reaction to antibiotics. Father's Day Weekend Megapost was 5th - which we love because it a) doesn't bring back medical-issue memories and b) has alot of great pics! We're One! Birthday/Thanksgiving/Cousins Mega Post! Who knows, maybe we'll post again occasionally. But we felt the need to at least put some sort of bow around the 4 years we kept up this blog, starting before the twins were born right up to 3.5-years-old today. Is it winter? Looking out the window, the snow is practically nonexistent, so I would say it sure doesn't feel like it. Snowless winters are no fun as far as the kids are concerned. Without sledding, snowmen and snow angels, what is the point? You're bundled up (since it is still frigid), but there's not much to do. Luckily, we did have some snow that lasted for a week or 2, so the twins got to have some fun! However, I shouldn't complain -- last winter it started snowing the day after Christmas and didn't let up until the robins returned. Ringing in the new year, we resolve to try and post more often!! !